Suspected arsonist is know to ride a bike and frequent the area near 6210 N.E. Columbia Boulevard. 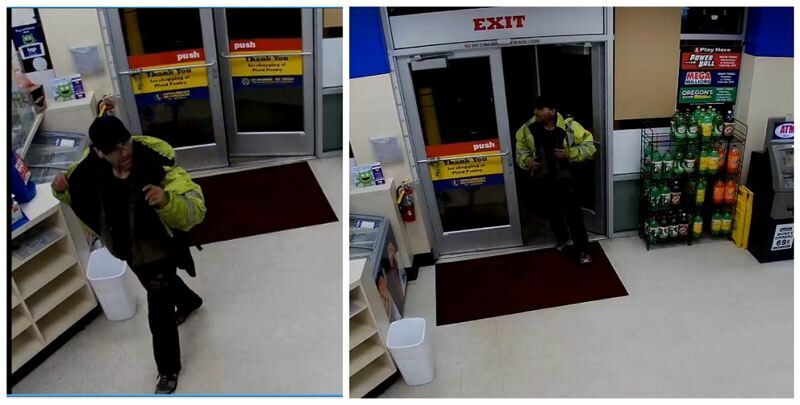 Local police and firefighters need the public's help identifying a man suspected of setting multiple fires at a "adult entertainment establishment." Portland police responded to reports of a commercial fire around 3:35 a.m. on April 2 at 6210 N.E. Columbia Boulevard, according to a news release. The building has housed strip clubs operating under the names Club Playpen, The Landing Strip and Pop-a-Top in recent years. "Arson investigators believe that the fire may be related to a previous arson at the same location and have identified a person-of-interest," authorities wrote in an announcement released this week. Police say they have obtained surveillance camera images of the suspect from a nearby convenience store. The alleged arsonist is believed to be a white man shown wearing dark-colored clothing and a bright green safety jacket. "He is believed to frequent the area and rides a bicycle," police say. Anyone with information can recieve a cash reward of up to $2,500 by submitting tips here.